Welcome! Yo-cart is a unique, fun and quirky product which is a funky addition to any event. It gives you the chance to offer your guests the most fashionable delight of the moment...Frozen Yoghurt! With over a dozen flavors from Peanut Butter to Passion Fruit, we guarantee that your guests tastebuds will be sent into overdrive! With its Vintage Styled Cart and colourful Whipper this transportable machine is guranteed to turn heads and create that magical spectacle that you have always wanted on your big day! This is where the fun starts, and really gives you the freedom to get creative and cater for your audience. Yo-Cart is all about the healthy option, providing you with an array of fresh exotic fruit including Melon, Kiwi Fruit, Rasberries, Strawberries, Blackberries and Pineapple to name just a few! 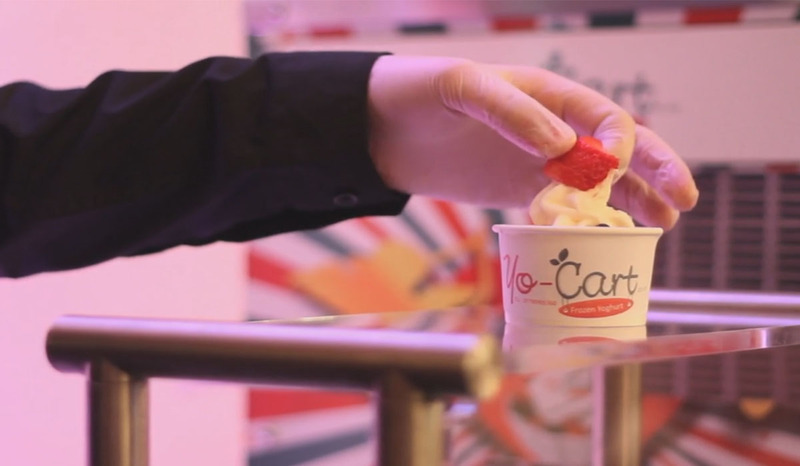 However here at Yo-Cart we too have a naughty side, so we also offer a selection of rather sinful toppings including Maltesers, Skittles, Chocolate Raisins, Sprinkles and quite frankly whatever else you want! We aim to make every customer smile, so as long as we are given time to prepare,the variety of toppings is endless! Yo-Cart Attends The LTA Finals in Penarth, Cardiff!!! Yo-Cart Kick 2018 off at Swansea Bay Campus!!! See Yo-Cart at the Vale Resort Wedding Exhibition on Sunday 27th April 2014. 11.00am - 4.00pm. There will be 3 Catwalk shows, Welcome bags from Debenhams, Over 80 exhibitors, and vouchers available.